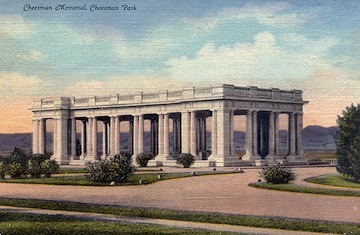 Cheesman Park was originally known as the City Cemetery. In fact, in Denver’s earliest days, the cemetery was the final resting place of gunslingers, captains of industry, and ladies of the night. It was the idea of a “properly romantic” cemetery that lead Denver founder, William Larimer, to designate the first resting place of Denver. In consideration of the topography and the slight uphill terrain, Larimer named his cemetery Mount Prospect. Unfortunately, Larimer’s vision of a stately, green, flower-filled cemetery never materialized. The need for water and the warring claims on the Denver real estate caused a helter-skelter mess of disorganization. 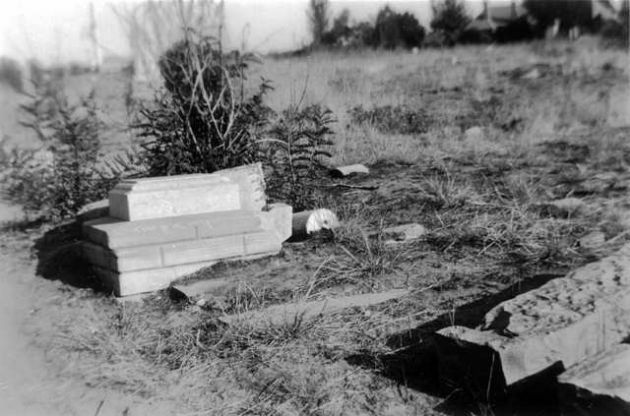 Newcomers were constantly attempting to build their new Denver homes on the land, allowing their livestock to graze freely among the sunken graves and toppled grave markers. The proliferation of sage brush and weeds made for an unsightly city cemetery. In March of 1870, the United States Land Office put an end to all of the conflicting land claims and declared the grave yard federal land. The close, yet out-of-the-way, location made it an easy last commute for the population, therefore, the people of Denver decided to make Larimer’s vision a reality. In 1872, Congress released the 160 acres of the original cemetery land to the City of Denver for a mere $1.25 an acre, to be used for the permanent burial of her citizenry. These boundaries now constitute the area between York to the east, Colfax Avenue to the north, 8th to the south and Downing Street to the west. What the new advocates for the beautification of Mount Prospect Cemetery had not considered was the total lack of irrigation to the area. Without the necessary water, the blooming trees and flower beds that they had planned for would never come to fruition. In fact, upon its official renaming of City Cemetery, the hill was a parched piece of prairie, complete with cacti and buffalo grass. However, it was the only City Cemetery, so as was the style of the times, many civic and religious organizations began to carve out their own particular areas in which to inter their deceased brothers and sisters. These groups included the Freemasons, Odd Fellows, and Civil War veterans among others.There was also a potter’s field for the impoverished dead and a Chinese burial ground. The Catholic Church in Denver purchased 20 acres and named their section the Mount Cavalry Cemetery. The Hebrew population purchased 10 acres to the east of Mount Cavalry. 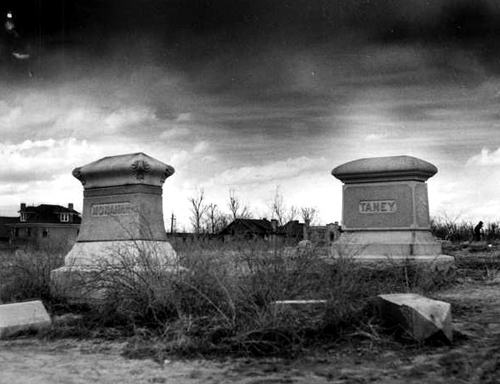 The City Cemetery struggled to entice new permanent residents and with the opening of Fairmount Cemetery in 1890, Denver’s original grave yard was doomed. The unkempt, weed strewn fields could not compare to the new botanic wonder that was Fairmount. Located at Quebec and Alameda, the new cemetery was the only “proper” resting place for Denver’s have and have-nots. This was certainly true after the installation of a streetcar line direct from downtown to the new grave yard. The old cemetery was soon abandoned, however, its real estate value had suddenly escalated. Along the western border of the once out-of-the-way burial ground was the quickly growing, wealthy suburb of Capitol Hill. In order to allow more growth and a new city park for Denver’s rich and famous, the bone yard had to go. Denver lobbied Congress to change the land use of the cemetery to that of a park, to which Congress soon agreed. However, their one request was that the new park be named “Congress Park”. Now, the big question was what to do with the nearly 6,000 bodies currently calling Denver’s newest park home? Initially, the call was to friends and family of the deceased to move the bodies of their departed loved ones to other cemeteries in the area. Unfortunately, by 1893 all of the families that were willing to move their kin had, leaving 5,000 bodies still six feet under. The city hired Edward McGovern, undertaker, to remove the bodies. The back-breaking work, the heat of the summer, and the lack of overseers made McGovern regret his low bid for the job. He soon had his workman falsely filling coffins with dirt and rocks, or filling multiple caskets at each grave site. The newspapers soon found out about the scandal, and in August of 1893 the city fired McGovern and issued an ultimatum. Remove your loved ones in 90 days or they remain permanently beneath the new park. Therefore, an estimated 2,000-3,000 bodies are still calling Cheesman Park their last Denver home In fact, bones are routinely found during regular park maintenance. After recovering from the Silver Panic of 1893, the overgrown park finally got some attention. Reinhard Schuetze, the landscape architect responsible for City Park and Washington Park, was hired to layout the now irrigated pastureland. The 80 acres were to be used for picnics, walks, flowers, and contemplation while enjoying the view of the Rocky Mountains. In 1907, one of Denver’s forefathers passed away, his name was Walter Cheesman. Cheesman was not known to be a kind or loving man in the City of Denver. His reputation as a Denver real estate baron and water company tycoon was notorious. He was close fisted and believed to be an ogre to his customers. It is this reputation that his wife and daughter, who built the Cheesman mansion after his death, thought to correct. Mrs. Cheesman offered the city a $100,000.00 donation to be used for a monument and pavilion in the new Congress Park. Their only stipulation was that the park be renamed Cheesman Park. It was their hope that future generations would remember Walter in a nicer light than his contemporaries. Congress readily agreed to the name change, and the Cheesman Pavilion was completed in 1910. The pavilion has been a meeting place since it was built, including a summer opera series hosted by Helen Bonfils. Despite the transformation of Cheesman Park, Mount Cavalry cemetery to the west was still in operation. However, the cemetery had suffered and was not an attractive funerary ground. The unkempt acreage became a place for naughty children to play games amongst the piles of broken tombstones. While many bodies were removed, many still remained. In 1950, the Denver Archdiocese deeded the land back to the City of Denver. The city agreed to move any remaining bodies to Mount Olivet cemetery, causing a catalog of ghost stories and tall tales among city workers. In 1959, the Botanic Gardens moved from City Park and took up residence over the old Mount Cavalry cemetery. While most bodies were moved, it is still a common occurrence for gardeners to turn over more than dirt with their spades. A marker remains today to honor those that first called the garden home. Today, Cheesman Park and the surrounding neighborhood shows no signs of its early difficulties. The area is known for large Denver homes, historic charm and the active lifestyle that the park provides. Denver squares and bungalows are the most prominent architectural styles that are found. The close proximity to the Botanic Gardens, downtown Denver, City Park and Cherry Creek have made the neighborhood a well-positioned Denver home base. Naturally, ghost stories are notoriously popular. If you would like more information on the Cheesman Park neighborhood, or any other Denver homes, please contact Vintage Homes of Denver at 303-564-2245.